Oh OK, I know you want to roll your eyes because someone is trying to sell you on a frozen fruit daiquiri. Get it out of your system. Please. So that we can continue on and I can tell you all about how delicious it is and completely NOT your typical frozen daiquiri. September is a crazy transitional month. Here in Los Angeles it gets crazy hot and for all intents and purposes it’s still summer even after the calendar tells you it’s Fall. But then suddenly temps will drop and we’re all scratching our heads wondering where we put that sweater. We’re also at the end of the stone fruit season. (Already?! I’m putting on a sad face typing this.) It seems that every week we are losing all my favorite fruits as quickly as they came on to the scene. I can’t eat another cobbler, so this week I blended some peaches into a daiquiri. 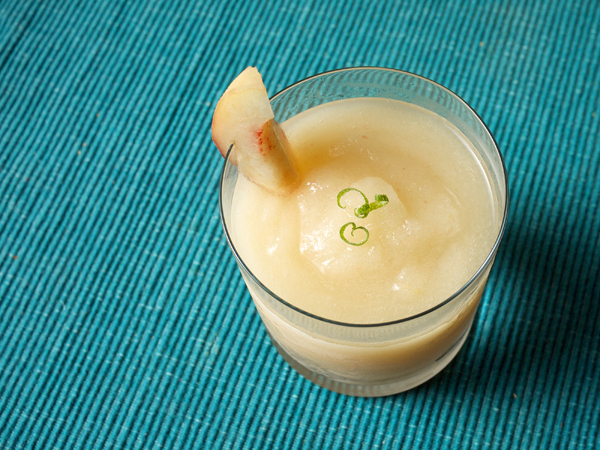 A not-too-sweet frozen cocktail with a dose of delicate, earthy flavors from white pepper and green tea infused syrup. So summery, so delicious, so not filled with high fructose corn syrup. The best part about this cocktail is that you can batch the base days ahead of time if you want. Or not. Making the base and sticking it in the freezer the night before gives you a super chilled mix (it won’t freeze) that when you blend with ice cubes the next day, it prevents it from getting too watery and diluted. If you’re pressed for time, you can just blend it all up without freezing too. I’m not going to stand in the way of you and this drink. Bring water to a boil in a medium saucepan. Stir in sugar to dissolve. Remove from heat and add tea bags. 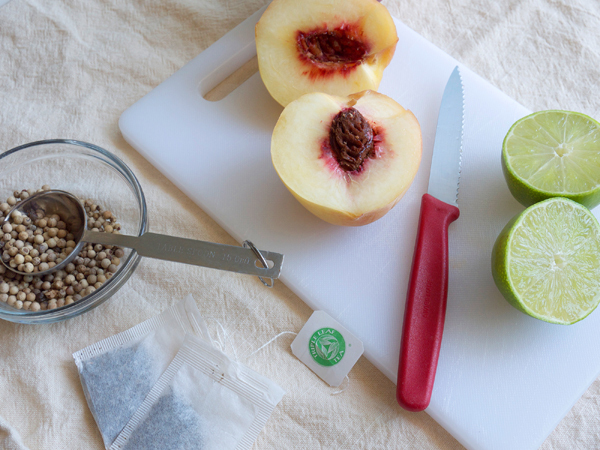 Let steep 5 minutes, then remove tea bags. Stir in peppercorns. Cover and let sit for 1 1/2 hours. Strain and bottle into an airtight container. Keep refrigerated up to 2 weeks. At least 1 day before you want to serve the drink, combine rum, lime juice, and White Pepper Green Tea Syrup in an airtight container. Store in the freezer for at least 8 hours. When ready to serve, pour pre-chilled base into blender with peaches and ice. Blend until mixture is uniform in texture. Pour into serving glasses. Garnish with a peach slice and lime zest, and serve. Juicy peach flavor that is not too sweet. Lovely earthiness from the white pepper and green tea while the lime and rum give it just enough zest. *I originally posted this recipe on Serious Eats! I can’t wait to try this, probably tomorrow after I get everything into the freezer. Awesome! Would love to hear how yours turned out. I do a white peach daiquiri with a habanero syrup. I like the use of white pepper though. Very unique. I hope we still have peaches at the Farmers Market here in North Carolina. Oh yeah! Peach with some heat sounds SO good. Fingers crossed for a long peach season! I’m not into this stuff, but it look so good. 🙂 Can’t wait to try this.